For new exterior window trim for your home located in Albuquerque, New Mexico, or another surrounding area, turn to the experts at ABC Seamless of Albuquerque. Our window trim will give your windows a proper finished look that we can ensure will match the rest of your home’s existing siding, soffit, and fascia. 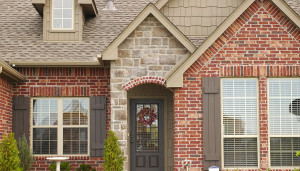 Much like our steel siding, our trim is seamless, customizable, and maintenance-free. Appearance isn’t the only aspect of window trim that you need to keep in mind; it is also important that the material you choose is secured correctly to your window in order to prevent moisture, bugs, and other unwanted intrusions from entering your home. At ABC Seamless of Albuquerque we do this by manufacturing your exterior window trim on site at your home in Albuquerque, NM, or another surrounding area, so that it is completely seamless and fits perfectly against your existing windows. Additionally, you can count on the experts at ABC Seamless of Albuquerque to arrive on time and provide exceptional installation services. All of our full-time employees are factory trained and committed to delivering exceptional workmanship. Furthermore, all of our products are backed by a lifetime, non-prorated, transferrable warranty that covers both the materials and labor required for your project. In the extremely unlikely event that you do ever experience a problem, we will send one of our employees to take care of the issue as soon as possible, assuring that you are completely satisfied with the end result. If you are ready to upgrade the exterior window trim on your home in Albuquerque, New Mexico, or another surrounding area, contact ABC Seamless of Albuquerque today.